Nylon Fabric: All Star Flags features nylon American Flags for sale that are proudly Made in the USA. 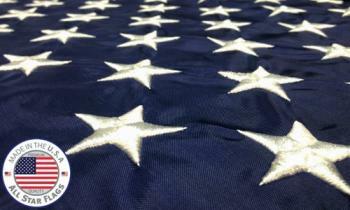 The nylon flags are our most popular fabric for US Flags. These USA-made American flags are made of a dense 200 Denier nylon weave fabric, the longest lasting nylon material available. The nylon American Flag is the best choice in environments with harsh sun conditions as it provides the best resistance to damaging Ultraviolet Radiation(UV). 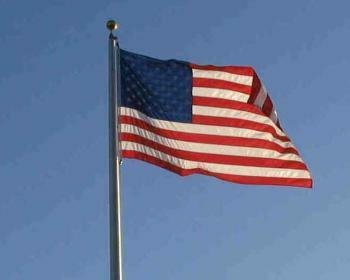 Our nylon American flag flies in the lightest breeze. The outdoor American flags for sale here have lustrous colors for a bright and colorful appearance. Quality Sewing/Manufacturing: All of our USA-made American flags feature LOCK STITCHING with color matched thread for greater resistance to fraying. The outdoor American flags for sale here are constructed using double-needle seams with back stitch reinforcement on the sewn stripes. We use a premium, extra strength polyester thread for excellent durability in any condition. 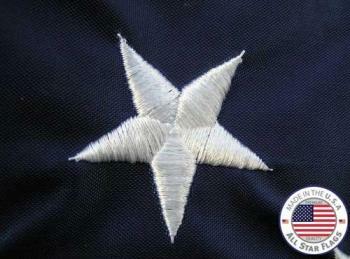 Flag sizes 16"x14" through 12'x18' have large, densely filled embroidered stars. Sizes 15'x25' and larger have appliqued stars. Each of the outdoor American flags for sale here are finished with a canvas duck header. The header comes complete with brass grommets for attaching to flagpole. Sizes 8'x12' and larger have a roped canvas header with galvanized metal thimble for extra strength. Each American Flag through size 6'x10' is made with four rows of lock stitching and flags 8'x12' and larger feature six rows of lock stitching on the fly end. This extra craftsmanship will help your flag stay fray resistant longer! 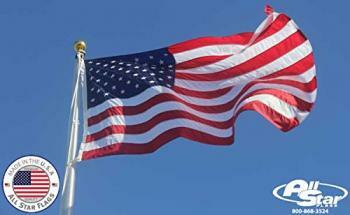 FMAA: All our nylon American flags are Made in the USA. Every US flag is required to be labeled with the country of origin. All our USA-made American flags feature Made in the USA markings and as an extra assurance our flags feature the FMAA stamp. The FMAA is the Flag Manufacturers Association of America and their “Certified Made in the U.S.A. ” certifies that your American flag has been made in the U.S. of materials that are domestic in origin and that all processes in every step of its manufacture were completed in U.S. facilities with U.S. labor. Feel confident that in purchasing an American flag from All Star Flags that great care is taken in guaranteeing that your flag is sourced and made domestically. 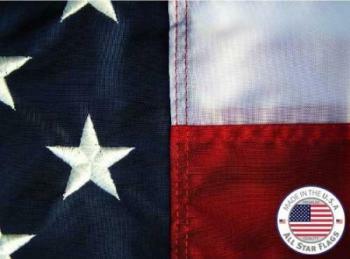 Look for our Made in the USA and FMAA stamps on each of our outdoor American flags. Wood Grain Spinning Flagpole - 6' x 1"